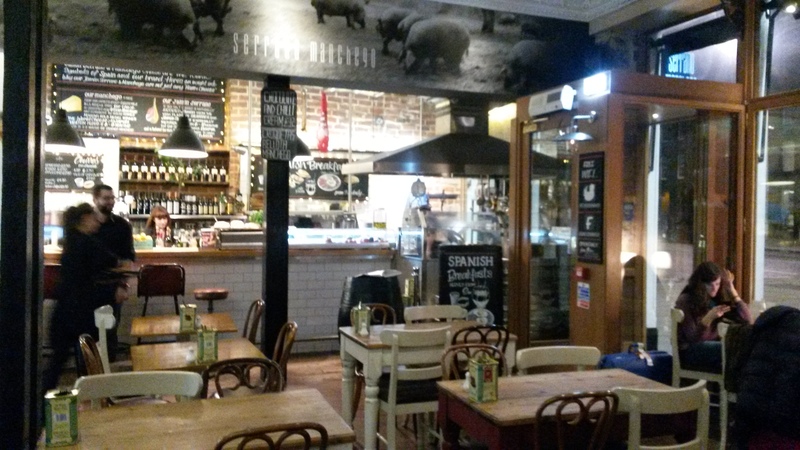 Stepping into Serrano Manchego is like being transported to a proper little, bustling, Spanish tapas bar. For starters, you certainly don’t feel like you are half way down Leith Walk in Edinburgh, and on a Friday night, by the time we left the place was rammed with a total mix of people. I mention the variety of diners, because it’s not something we do particularly well in Britain. Bars in the UK tend to have an age range, a style and a specific clientele. 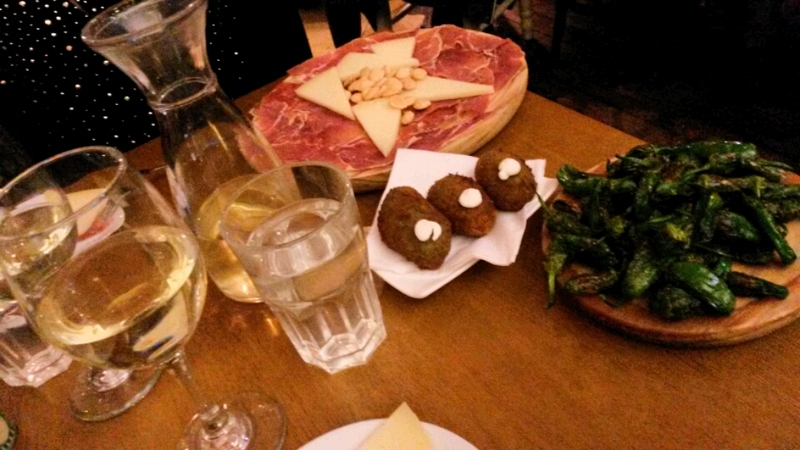 In Spain, everyone goes for tapas, or if you are up north, pinxtos. The best bars are usually the ones that don’t look much from the outside – those are the ones with the people spilling out the door and onto the old, cobbled streets. You feel as comfortable popping in for a vino blanco and a few tapas with your girlfriends, as you do if you were with your Gran or two children. No-one bats an eyelid, everyone is there for the food. When we called to book the only table available was at 7pm, despite this being the exact opposite of how the Spaniards like to enjoy their food and drink (late! ), Ruth and I grabbed early table and watched the place fill up. 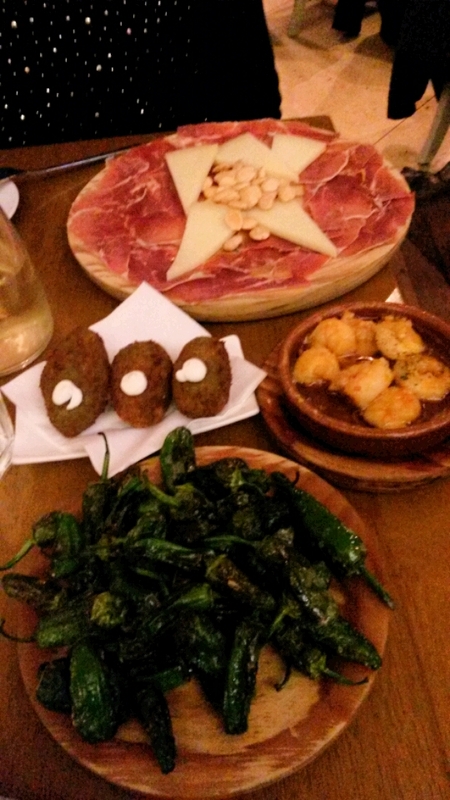 The only way to order from a tapas menu is to share! The dishes arrive at the table as and when they are ready, and it’s a great way to spend a few hours on a wintery night. 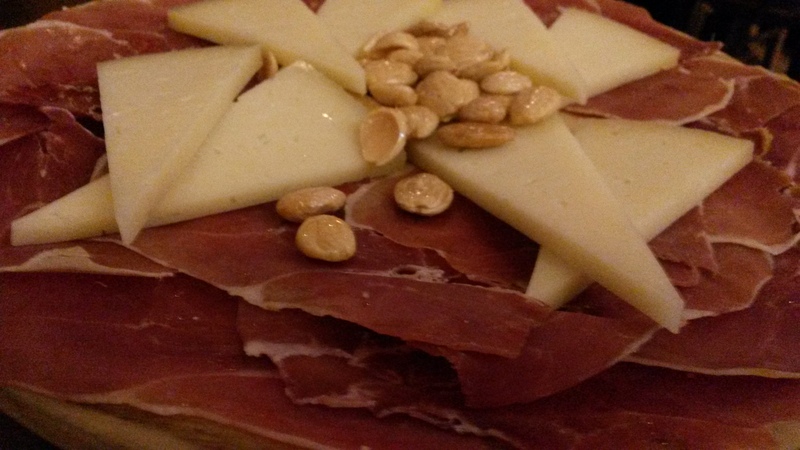 We started with a half carafe of house white wine and a platter of the serrano jamón & manchego. An enormous dish, we clearly weren’t going anywhere in a hurry! 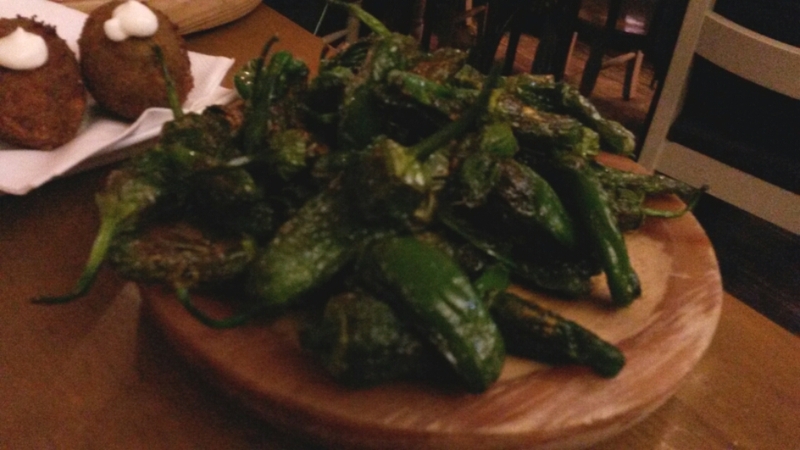 Our table quickly filled up with some pimentos verde fritos, croquetas de espinacas y queso and some delicious spicy gambas. A basket of fresh bread and olive oil completed the line up. 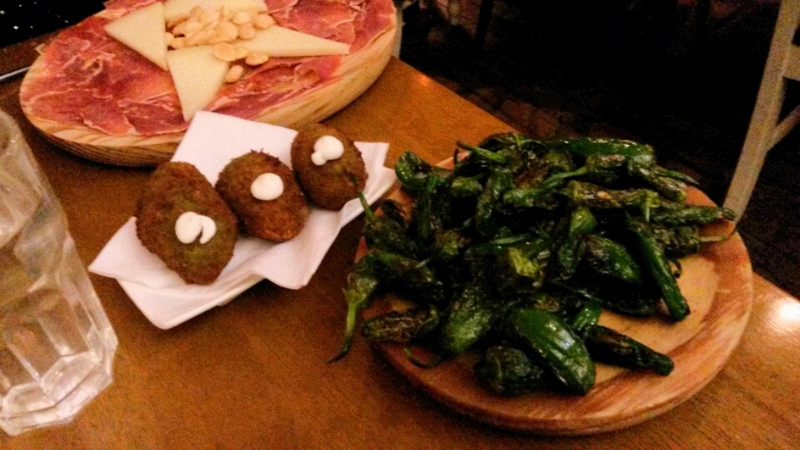 The croquetas are a very typical Spanish tapas dish and did not disappoint. 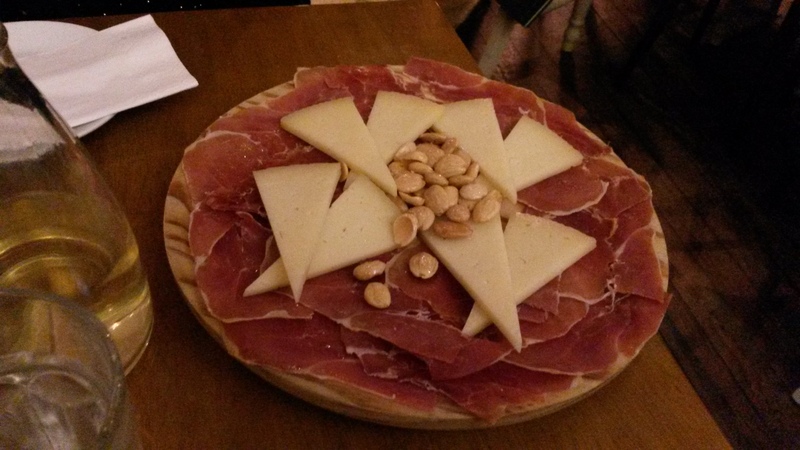 Traditionally they are filled with cheese & ham, here is a great recipe on how to make them at home – I’ll be back to try Serrano Manchego’s version! Everything we ordered was delicious. In size, the prawns weren’t anything to write home about, but with plenty garlic and spice, the flavour made up for the size. 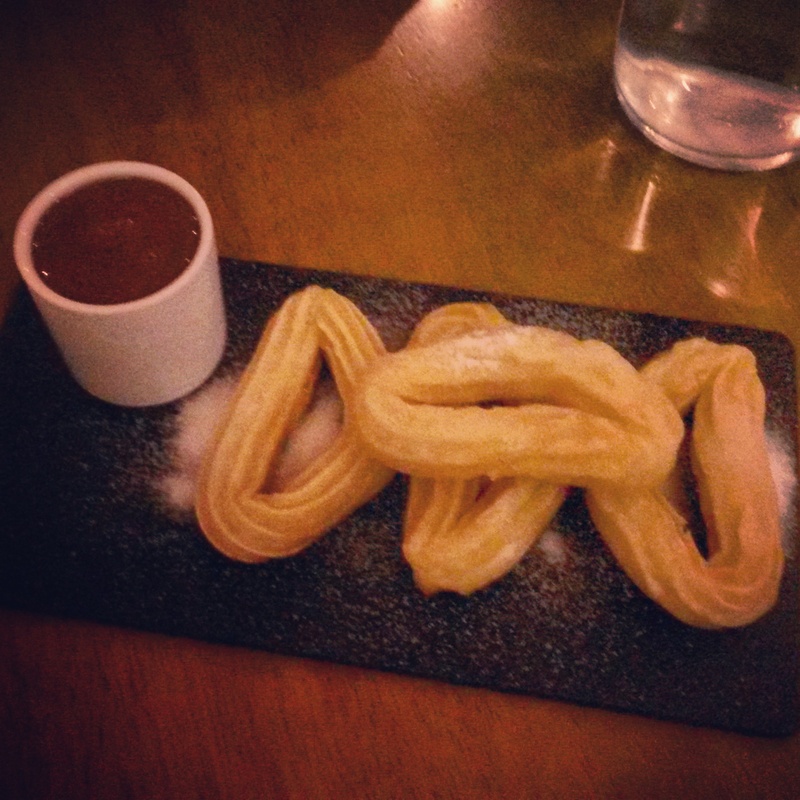 After a small break, we definitely had room to try the churros y chocolate – a rather bizarre, yet moorish Spanish dish. I would place them in the doughnut category and admit they are a strange delicacy, even stranger when you consider they are traditionally eaten at breakfast time. Usually long and thin in appearance, you dip them into a delicious pot of chocolate, and it’s wise not to have too many! It’s a love/hate food, and I fall in the love category, as often happens with anything related to chocolate! With not another mouthful left in us, we rolled home and I certainly slept soundly! Our bill came to £25 per person including tip, which we felt was reasonable for great food, lovely service, and buzzing atmosphere. I’ll definitely be back, I hear the breakfasts are very good … if only it wasn’t all the way down Leith Walk!